Email often carries more than just a text message. It is also used as a medium for other types of data. If you want to send a document, an image or a spreadsheet simply attach it to your mail. To protect mailbox databases from uncontrolled growth due to massive use of mail attachments, Microsoft Exchange 2019/2016/2013/2010/2007 incorporates a special set of message size limits in its configuration. The video below provides a step-by-step guidance on how to check and change email size limit. Below the video walkthrough, you can find a detailed description of the same procedures. There is no size limit set on the Administrator mailbox. Bear in mind that the last line of the script (Get-Mailbox) returns information only about the Administrator’s user mailbox. Replace it with the user name you want to check. Alternatively, you can remove the Administrator phrase entirely, however this will result in a list of all mailboxes present on the Exchange. To change the above size limits you can use a PS script too. The example below shows how to reduce the size of messages accepted by the transport service from the 25 MB to 15 MB. There is a drawback however. Limits presented above are set for the message as a whole, no matter if they contain attachments or not. If the message is extremely large and contains no attachment, it will be stopped. The only way to set size limits exclusively for attachments is to use a hub transport rule, which will detect and block messages if their attachments are over a specified size threshold. New-TransportRule -Name LargeAttach -AttachmentSizeOver 10MB -RejectMessageReasonText "Message attachment size over 10MB - email rejected." The command creates a rule named LargeAttach that is triggered by any email with attachments larger than 10MB. The rule then stops the message from delivery, and sends back a notification about that fact to the original sender. Setting up message and attachment size limits to stop bloating your mailbox database seems quite reasonable. However, this still does not resolve the problem fully, as over time the database will grow anyway due to increased email traffic. Even small attachments can affect your server when they are sent in large quantities. Sure, you can even lower limits, but this is a dead end situation. In today’s world a 5MB PDF attachment is nothing uncommon, and it is safe to assume that these numbers will only grow. Fortunately, there is a solution that keeps your database safe and allows even large attachments to reach your organization – CodeTwo Exchange Rules Pro. It features the attachment strip/compress function. It gives you ability to remove attachments on the fly from messages traveling through your server and place them in a different, separate repository. It also leaves a link to that repository in the message itself so the recipient can still access the file with no problem – check out all available email attachment stripping and compressing capabilities of CodeTwo Exchange Rules Pro. Thanks. Worked perfect on Exchange 2010! I am running exchange 2016. The get commands above do not work and are not listed when I enter Get-ExCommand. Do I have to load these commands? Thank you, it really help me to solve my problem. 5. Do step 3 an 4 above for the send connector. There are several things that could be causing this, but the first one to try is changing the maxrequestlenght value in the web.config file on your OWA server to a (much) higher one. It has also been reported that OWA doesn’t interpret ‘unlimited’ value settings correctly, which may cause errors like yours. In these cases setting a high numerical value should resolve the problem. Having an issue, Exchange reports unlimited attachment size, however users are getting errors stating that the attachment size maximum is 5mb. The users are using the OWA app. Looking for some help. Once the size is changed and the rule implemented, how do you add the senders address to the mail that is sent to a recipient saying the mail is blocked? 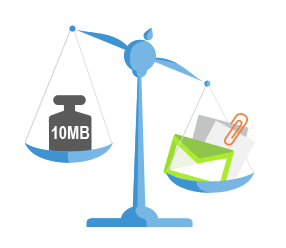 We have a rule implemented on Office365 that generates an email to any recipient of mail over 10MB. However it doesn’t show the senders address in this email. This is not achievable within Office 365 at this point. Follow CodeTwo on social media – if we will have a solution for the issue, we will announce it there. Thanks extremely helpful, detailed and clear documentation worked (in Bostonian) “like a chaam”!